Robert Eugene Dernier, also known as “Bobby”, was a center fielder for the Philadelphia Phillies and the Chicago Cubs in the 1980s. The fleet-afoot 1984 Gold Glove Award winner was also nicknamed “The Deer” by The Wrigley Faithful. Dernier was the lead-off hitter Cubs’ 1984 N.L. East Championship team. Dernier was named the Cubs major league first base coach on August 23, 2010, after serving as the team’s minor league outfield and baserunning coordinator since 2007. As the baseball season winds to a close, we found ourselves with some really good seats to the Cubs game on a cold September night. 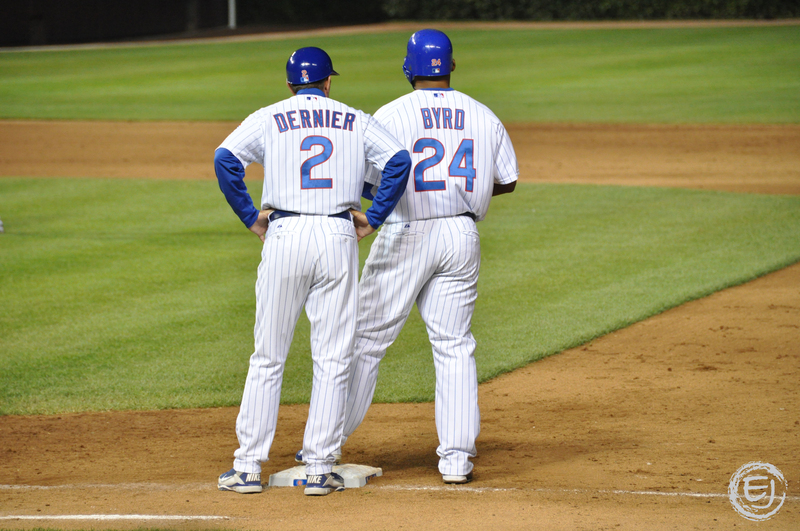 I caught a picture of center fielder Marlon Byrd have a quick conference with first base coach Bobby Dernier. This entry was posted in Chicago, Sports and tagged Chicago Cubs. Bookmark the permalink. I’m enjoying your days, and writing about the Wrigley lights right now. It’s the day I dread, the end of baseball season down the street. Wonderful images!